Digital files, ca. 3 GB. The Uffelman family has a long history in the Kitcehner/Waterloo region. Jacob Uffelman (b. 1860) purchased the Ontario Seed Company in 1911, which continues to be one of Canada’s largest suppliers of wholesale seeds, and was Mayor of Waterloo from 1904-1905. Jacob and his wife Eliza nee Elsley (1865-1930) had four sons and a daughter: William (b. 1889), Orley (b. 1891), Walter (b. 1893), Sheldon (b. 1894), and Gladys (b. 1895). Sheldon, William and Orley all served in the First World War. Sheldon was killed at Ypres in November 1917, and his name is inscribed on the Menin Gate. William and Orley survived the war. The Uffelman Fonds, which includes a digital collection of the First World War letters of Sheldon, William, and Orly, are courtesy of descendants Scott Uffelman and Clare Martin. 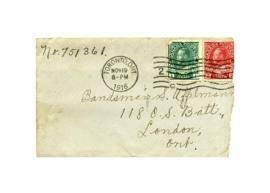 The Uffelman Fonds contain a collection of letters written by three brothers, Sheldon, William, and Orley Uffelman of Waterloo, ON, during the First World War. Note that the transcription of each letter is under the "Scope and Content" section of each file, as well as a downloadable .pdf of each original letter.